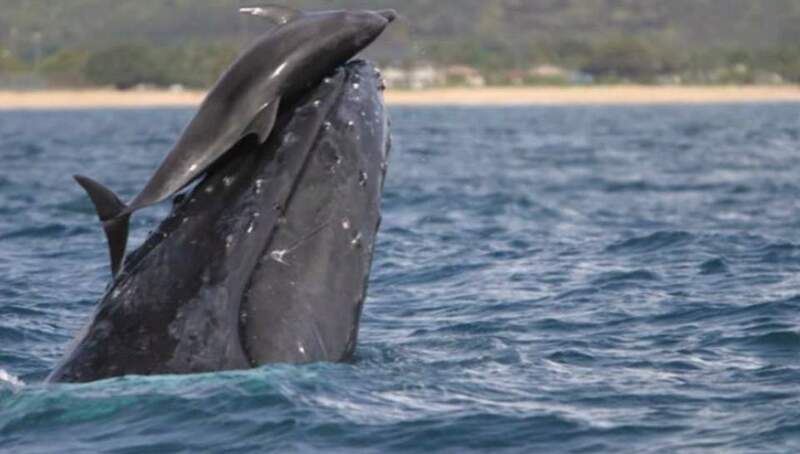 In two different locations in the coast of Hawaii, scientists have observed unusual interactions between bottlenose dolphins and humpback whales as dolphins “rode” the heads of whales: the whales lifted the dolphins up and out of the water, and then the dolphins slid back down. In the video published by the American Museum of Natural History, the two species seemed to cooperate in the activity, and neither displayed signs of aggression or distress. Whales and dolphins in Hawaiian waters often interact, but playful social activity such as this is extremely rare between species. One event took place in Kauai, where the dolphins and the whales are swimming close together. A dolphin laid herself across the head of a whale. Then the whale slowly raised the dolphin out of the water until the dolphin slid back down in the water, tailfirst. A few months later, a similar interaction was observed near Maui, also between a bottlenose dolphin and a humpback whale. Again a dolphin laid herself across the head of a whale, and the whale lifted the dolphin six times, the dolphin sliding back into the water after each “ride”. The slowness of the whale’s movements, the dolphin’s obvious cooperation, and the repeated lifting convinced scientists that this activity was playful rather than aggressive. These rarely seen examples of spontaneous play hint at the complexity of interspecies relationships in the wild, especially the more intelligent species like dolphins and whales. A bottlenose dolphin rides a humpback whale in Hawaii coast. Many species interact in the wild, most often as predator and prey. But recent encounters between humpback whales and bottlenose dolphins reveal a playful side to interspecies interaction. In two different locations in Hawaii, scientists watched as dolphins “rode” the heads of whales: the whales lifted the dolphins up and out of the water, and then the dolphins slid back down. The two species seemed to cooperate in the activity, and neither displayed signs of aggression or distress. Whales and dolphins in Hawaiian waters often interact, but playful social activity such as this is extremely rare between species.